Monday is World Cancer Day (WCD), which takes place every year on 4 February. 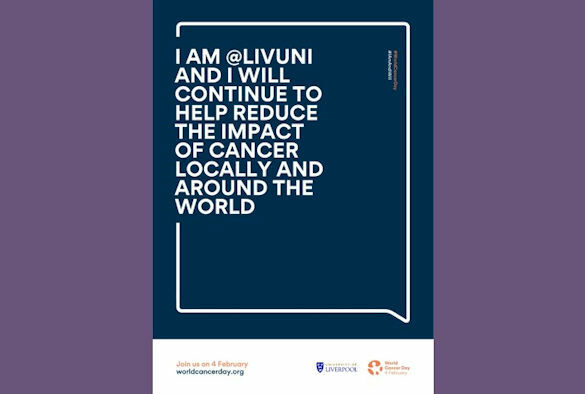 “The University of Liverpool is home to hundreds of researchers who are working collaboratively, with other researchers locally and across the globe, to help reduce the impact of cancer in Merseyside and around the world. “Scientists here in Liverpool are helping to deepen our understanding of the biology of cancer by studying the cell itself, looking at changes which occur in cancer, and working out how to stop, reverse or minimise the impact of those changes. They are also looking at how the cancer cells communicate with their surrounding environment in the body, and then spread. “We have research groups dedicated to improving diagnosis methods and techniques, because in general the earlier a cancer is diagnosed, the easier it is to treat. We are also home to research groups focussing on the development of kinder, less invasive cancer drugs and other treatments. Other Liverpool-based scientists are taking on specific cancer types, and we have large patient-facing research groups working on cancers of the blood, head-and-neck, pancreas, eye and lung. “Our researchers all have one common aim, to reduce the impact of cancer. “We are extremely proud of our research, but also of the work we do in the community. Our outreach programme aims to engage local individuals, community groups and stakeholder organisations in a varied and innovative programme of educational and social events. These include lab tours, all of which are designed to help local people understand more about cancer and what they can do to reduce their own risk and the impact of cancer in their community. “We work with local schools and colleges to encourage students to consider careers in science, research and clinical care. We deliver cancer symptom awareness and early diagnosis messages at community events. To help those living beyond cancer to understand / accept and move on from their condition we also work with patient and survivor organisations. “Working with our community and statutory partners helps us to ensure that the impact of cancer locally, and the needs of our community are understood and addressed. “This year marks the launch of WCD’s ‘#IAmAndIWill’ campaign. ‘I Am and I Will’ is an empowering call-to-action urging for personal commitment and represents the power of individual action taken now to impact the future. “We are organising an event on WCD to bring together scientists, researchers, health and social care professionals, patients, survivors and members of the public, to celebrate survivorship, advances made in cancer diagnosis and treatment, and of course the contribution this University makes to the global campaign to beat cancer. Videos of some of our staff talking about their research can be found here. The University’s Institute of Translational Medicine will also be holding a WCD event in the foyer of The Royal Liverpool University Hospital. The event will hope to encourage the public to interact with our researchers as well as learning about some of the research going on at the University as well as the importance of combined research between the NHS and the University. More information about WCD and the #IAmAndIWill campaign can be found here. Read more about the University’s cancer related research here. Read about how our academics are researching the newest next-generation cancer drugs and dealing with the toxicity that can accompany these novel therapies here.